Back in my day - the roaring 1980s and that last golden era of boxing, it was not uncommon for multiple fights to be broadcast on national television on the same day. Hell, it seemed that every weekend - both Saturday and Sunday - had at least two TV fights each day. There was a lot of channel flipping. Then that futuristic creation - the VCR - helped a little. But just a little. Once I started taping fights for my boxing library, I felt the obsessive urge to get both competing fights on tape. Since I couldn't be at two places at the same time, I needed to hone my boxing priorities. If Frank Fletcher was fighting at the Sands on NBC and Howard Davis Jr. was fighting at Resorts on CBS, it was a no brainer. Frank the Animal got my vote, and my then-$25 blank VHS tape. I think I have every one of his old fights on tape. But it wasn't always such an easy decision. Such is the case this Friday night when two local fight cards play out at the same time about 60 miles apart. Competing fight cards (same day, same time) are such a rarity these days. Even on TV, the occasional conflict between HBO & Showtime broadcasts is eased by staggered start times, multiple replays, on-demand options, not to mention having recording devices practically in every room of the house. So this Friday's dueling fight cards (Blue Horizon vs. Atlantic City's Tropicana) made me realize just how rusty my boxing prioritization has gotten in the past 25 years or so. Add to it the fact that neither card is televised, and you can start to feel my pain. But this Friday both shows feature local boxers. The Blue Horizon starts at 7:30 and is the usual hodgepodge of local talent. It seems the advertised main event has fallen out. 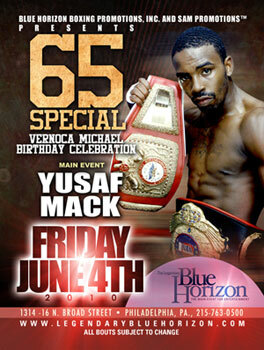 So contender Yusaf Mack will NOT be on the card. Still, a number of local standouts will be on display. The co-main events feature young Coy Evans vs. Babaro Zepeda over six rounds and Farah Ennis against Steve Walker. The story for both of these fights is the same - "Can the local rising star cut it against out-of-towners with far more experience? Going in it appears the answer in both cases is a resounding yes. True Coy Evans has only nine fights under his belt and his foe, Zepeda, is a veteran of 32 bouts. But Evans is 8-0-1 while Zepeda is 9-21-2 with just 2 knockouts. The Chicago-based boxer has won just one fight in his last 13. The same goes for the 13-0 Farah Ennis fight. He takes on the shopworn 24-24 Walker, who has won 5 of his last 16. To be fair, this guy appears to be a viable trial horse for the powerful Ennis, but probably not much competition - he's been stopped 20 times. The rest of the card is filled out with a lot of good young pros like Darrell Jones (3-0), Keenan Smith (1-0), Olivia Fonseca (3-2-2), Ismael Garcia (1-0), and local clubber Gustavo Dailey (4-8). The Atlantic City show begins at 8:30 PM and has one big attraction for me. 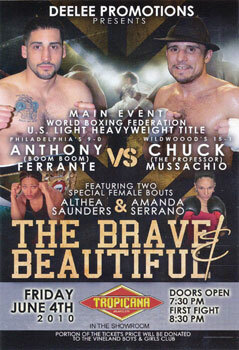 The main event is a very attractive light-heavyweight bout between Wildwood's Chuck Mussachio and Anthony Ferrante of Northeast Philly. It's a good match. Mussachio is further along in his career. At 15-1-2 (5 KO), he's the experienced fighter with his biggest win against a former champ, Carl Daniels. Boom Boom Ferrante has no such name on his record, and goes in just 9-0 (4 KO). In Mussachio, Ferrante will face his best opponent to date. But Boom Boom has looked good in his limited experience and fights with a great deal of confidence. We'll see if he's up to the task. I believe the fight is for the "Italian Championship". That doesn't mean so much, but it sure adds an air of festivity to the show. The remainder of the shore card is rounded out with Delaware's Mike Tiberi in a six-rounder plus other area fighters in a set of six four-rounders. When you weigh the two cards, the place to be is clearly in Atlantic City. The Mussachio-Ferrante match is the one not to miss. However, I'm going to miss it. Again call me crazy. 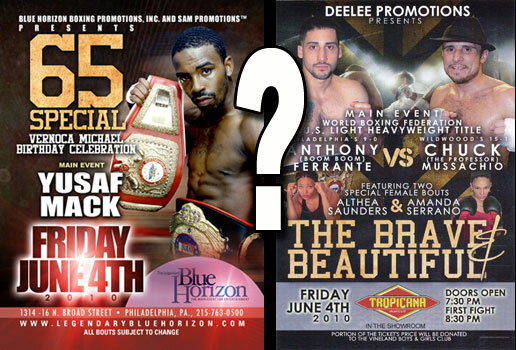 I guess these days my priorities are hard-set not only on Philly fighters, but on Philly fights too. I'll be at the Blue Horizon on Friday night. I have to be there. If for no other reason, I'll be scouting possible Briscoe Award nominees for 2010. God forbid I miss something important happening in a Philly ring. My gut says it will be a run-of-the-mill evening at the Blue. But you never know. It wasn't an easy decision, but my mind is made up. I also passed on the Boxing Writers Association dinner in New York, which is also slated on this bust Friday night. So I'll be in North Philly on Friday night, probably wishing I was in Atlantic City. Or better yet, wishing I could be in both places at the same time. But that's just me.